Every one of us has got a story. And if we took a moment, and went around the room, and were completely honest with ourselves and each other, I’m not sure that the results would be very pretty. In fact, I would bet than many of our stories would be quite messy. They’d be stories of being hurt and hurting others. They’d be stories of being lonely and unloved. They’d even be stories about failing. And, so often, we feel that we are all alone in these struggles. That no one has suffered as we have suffered. That no on has ever sinned as we have sinned. That no one has ever failed as we have failed. But if you just read the Scriptures, let alone the words of our Holy Fathers and Mothers among the saints, you’ll quickly discover that you are not alone. If you don’t believe me, just take today’s Gospel, one of the most difficult moments in the life of the disciples. 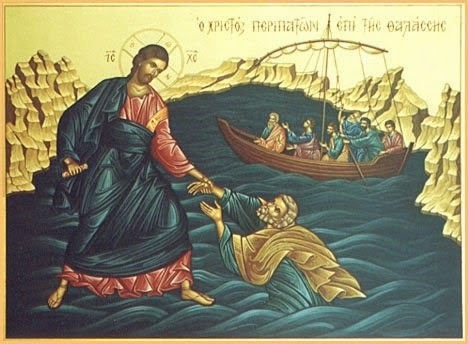 In Matthew 14:24, the text literally says, “the boat was being tortured...” Certainly not the way you’d like to spend your evening; out on the lake, with waves crashing, wind wailing, and your boat being beaten to pieces. 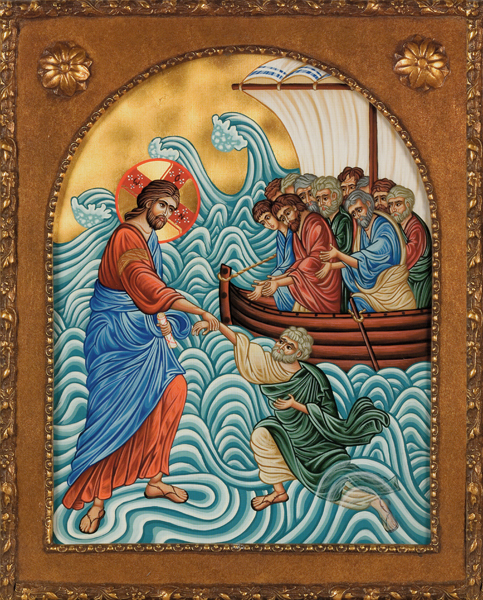 But along comes Jesus – cool, calm, and collected, doing what he always does: bringing order to the chaos of our lives. And so, you see, these 12 verses – Matthew 14:22-34 – are pretty much the Orthodox Christian life in a nutshell. Our stories are messy, our lives are tossed about amid the storms of life, and we are literally struggling to stay afloat, we are literally struggling to stay alive. But Jesus’ story is one where all is well, and not even a terrible storm, not even death itself, could ever win the day. 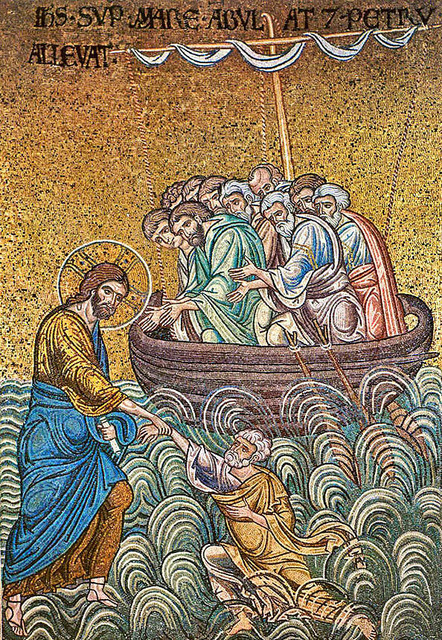 It is quite strange, really, that in the middle of this tortured sea, sitting in his tortured boat, with his tortured co-disciples, just as Jesus is arriving on the scene to save them all…at that moment, Peter decides to go for a walk. You see, instead of letting Jesus get IN, St. Peter gets OUT. But why did Peter get his socks wet? Some say it is because Peter had a great big faith. So then they tell all of you to go home and try to be like St. Peter. Over the side and into the water, just have faith. So why did Peter get his socks wet? There are other folks who say it’s because Peter had a really little faith. He was always trying to prove how strong he was. So today he hops over the side, and 12 seconds later he’s crying out – Save me! And in verse 31, Jesus, of course, does. So which is it? Is it that Peter had a great big faith or a really little faith? And the answer is: Peter is Orthodox. Peter is what we all are. Good days, bad days. Up days, down days. Holy days, sinful days. Strong days, weak days. Successes and failures. But, given all of that, what do we do? That is of course, what we really want to know. Do we get our socks wet or not? I heard about a seminarian a few years back who preached on this very text for a homiletics class at seminary. The young man was from Texas, with a very, very rich Texan accent, and this is how he started his homily: Jesus was fixin’ to walk on the water. And that, dear friends, is the answer. (It’s so good, in fact, that I hope he got an A.) Jesus was fixin’ to walk on the water – that’s the answer! This text is all about – Jesus! It is not about Peter and it’s not about you and it’s not about me. It is not about you doing what you want, getting what you want, or taking a risk. And it is certainly not about you walking on the water. It is not about you sinking. And it is not about your faith. It is about Jesus! And it is about Jesus – fixin’. Fixin’ to walk on the water, yes. But it’s also about Jesus fixin’ everything. It is about Jesus coming near, and doing what He does, and getting what He wants – and what He wants is you. Christ first. We follow. That is what it means to be a disciple of Jesus Christ. And in Him, and by His mercy and loving-kindness toward us, that is our story as well.